oh my word...almond puff please! Rachel Ferrucci is a dynamo. We've been friends on Twitter and Collective Bias for a while but I finally got to spend some time with Rachel and watch her in action at Evo, where she was in charge of coordinating the speakers– no small feat but she did it in inimitable style, often with a miniskirt, towering stiletto heels and always with a great sense of humor. Rachel is a busy, busy, busy lady with a zillion different projects going at all times. So naturally she decided to up the ante even further, launching her own line of bath and body products designed to pamper and protect skin. She spent eight years refining the products in the Touch'd line and now she's ready to share them with the world. I received the Moisture Myst, which is a spray-on that absorbs quickly leaving only a faint scent and soft, soft skin. The Tropical Paradise scent is a bit floral for me (Cherry Bomb or Almond Puff would be more up my alley) but I love how non-greasy it is and easy to apply. It's really great for parched, sunburned skin because it's light ultra refreshing. It is also fantastic for squirmy kiddos who don't like to sit still for lotion application after baths. Just spritz it on damp skin and they'll never know what hit them… Moisture Myst has been great for Roo's occasional eczema patches. Organic Sugar Scrub, Moisture Myst, Bath Butter (this one sounds amazing! ), Foaming Salt Soak and Tub Tea Bags. 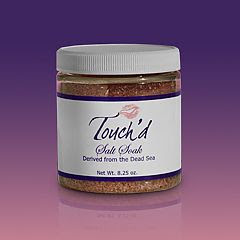 To enter and win your own Foaming Salt Soak, please comment on this post with which Touch'd scent you want to try most. For an additional entry, post my button on your blog (see code on sidebar), join the Touch'd Facebook page, follow @Touchd on Twitter, follow Superdumb Supervillain, follow me on Twitter, fan Superdumb Supervillain on Facebook, fave me on Technorati or subscribe via email or subscribe via reader. Leave an extra comment letting me know what you did for each additional entry. yup i'm a facebook fan! i email subcribe to YOU! yup facebook fan ya too! I'd love to try the Cucumber Melon! I'd want the Almond Puff scent. I love the tropical paradise. I would like to try this in the warm vanilla. I'd like the sugar n spice sccent. I'd choose the tropical paradise. Tropical paradise!!! I love Rachel! I'd like to try "Dream"
I'd chose the sugar and spice :) Thanks!